The following are a few strategies to increase the sales of a small business. A common concept is that money is the asset for small business owners but, in fact, time is the real asset. If you lose money due to any reason, it will come to you one day if you work hard. What cannot come back is the time you have once wasted. So, spend your valuable time carefully on activities that really make a difference for your business. Many small business owners spend a lot of time at trade shows and exhibitions to increase exposure and, ultimately, sales. They collect hundreds of cards from people who seem to be interested in your product. After the trade show, you contact them in hopes of getting a purchase order from them, but they are in no way interested in your products. Your goal is not to waste time on such dead ends. Identify potential customers and spend time with them. Answer their queries about quality, price, return policies, and customer service in detail and make them your happy and satisfied clients. These customers will not only purchase your product but refer others to you. This referral will increase the sales of your small business like no other. In today’s world, everyone is interested in their own problems. The same rule is applicable to your customers. They are interested in their problems and seeking help to resolve them. Being a small business owner, it is your foremost strategy to ask customers about problems they are facing. Ask them what their needs are and what types of products they are in search of. When you ask customers about their problem, they feel heard and important. They happily tell their problem in detail. After listening to them completely, start discussing the solution that your product will provide them. It may be possible that the seventh feature of your product is the solution, but, while describing your product to this particular customer, tell them that seventh characteristic first. After finding a solution, the customer feels relaxed and will listen to the rest of your sales pitch discussion happily and attentively. The customer who finds a solution in your product will likely buy it and this small business strategy will increase sales. When a customer does not respond to your email, instead of sending a new email, reply to your own email. Replying to your own email serves two purposes. One is that the client will see the original email. Secondly, you come to know whether the first email was received or not. If after the second email, the client says that they are not interested in your product, that’s why they didn’t respond to the first. Stop wasting your valuable time and end contact them. Often the customer says that they are interested but could not respond to the first email due to some reason. Accept them. However, if no response to the second email was received, send a third email after a few days. Ask the client directly whether you should stop contacting them or not. This email has a positive effect. A client who is interested will send correspondence email as early as possible and the other one will send a refusal. After knowing the exact status, proceed accordingly. Personal communication can increase the sales of a small business. This strategy proves extremely useful because, after personal contact, the customer doesn’t consider your email just an automated response. In a personal message, discuss the customer’s experience with your product. Ask them if they have any questions or concerns. In personal correspondence, the client should know that you are making an effort to write them a personal message despite your busy schedule. By valuing your prospective customers, sales can be increased tenfold. Build a positive attitude of teamwork within your sales workforce. Don’t do things to divide them. 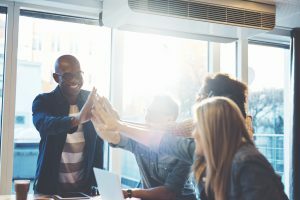 The best sales team is the one that works together. By building positive dynamics within a team, they can communicate frequently and freely. Sales are increased by utilizing information shared within the team. Teamwork increases sales in the long run, independent of the size of the sales. An increase in sales can be achieved by following a few simple strategies. These strategies basically revolve around the customer always. As they say, the customer is always right.